Dr. Wendy McClelland became an entrepreneur just before midnight on March 3, 2009. She’d spent the night cruising the icy streets of Airdrie, Alta., in her green Subaru Outback, filling the citizenry’s doorsteps with Milk-bone doggie treats and flyers for her new mobile veterinary business. McClelland—a trained veterinarian—got two calls the next day (“I was so excited!”) and a dozen more over the ensuing weeks. It was early validation that people really did want a different kind of vet service. 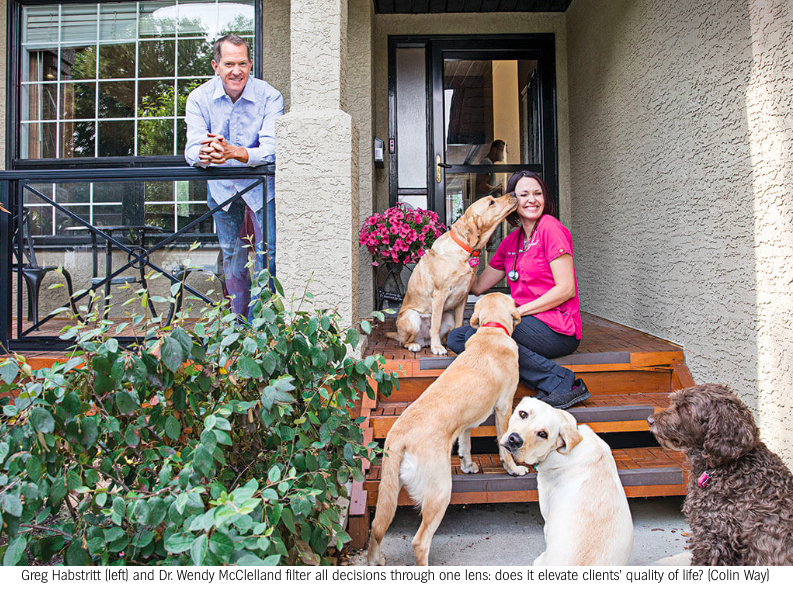 McClelland is the co-owner and Chief Medical Officer of Vets To Go, which today employs 31 people and serves pet-owners in Calgary and Edmonton. Sales have spiked 986% over the past five years, earning the company the No. 72 spot on the 2017 PROFIT 500 ranking of Canada’s Fastest-Growing Companies. In a sector not always known for service, it has amassed a fiercely loyal client base by first delivering a novel offering, then adding complementary offerings reverse-engineered to fix specific pain points. It didn’t happen overnight, of course. Soon after McClelland’s Midnight Milk-bone Caper, she realized she needed help. “I knew nothing about running a business,” she admits. Enter Greg Habstritt, a serial entrepreneur and business coach based in Calgary. Habstritt started working with McClelland three months after her launch, advising on everything from start-up basics to branding (the name “Vets To Go” came at his suggestion). The more Habstritt learned about the business, the more potential he saw. In 2012, he formally joined the company as a partner and president, with an eye to expand it. That insight changed everything. “If you’re servicing based on convenience, then you need to, for example, be available 24/7,” Habstritt says. “But if clients’ driving desire is love for their pets, the strategy is completely different.” The mission of Vets To Go thus became simple: to deliver exceptional service in a space in which animals and their owners are comfortable. Now, there aren’t many veterinarians who don’t love animals or pride themselves on excellent care. But not many are willing to crawl under a bed or into a fireplace to calm down a stressed-out cat. McClelland has done both, and each of the company’s vets—who arrive at clients’ homes in a bright magenta SUV, sporting uniforms of a similar hue—have similar tales to share. Long-time client Alyssa Palmer—a carless “parent” of three cats—loves this commitment. The “lack of stress” is invaluable, she says, adding: “They don’t rush you through an appointment; you can talk about multiple issues and needs.” Palmer’s most recent call to Vets To Go was for what the industry euphemistically calls “an end-of-life experience.” The procedure was done in her own home instead of a strange clinic—it was compassionate, not cold. “Their service made a difficult time a little easier,” Palmer says. “[Euthanasia] is the worst thing that happens to a pet owner,” McClelland says. “We thought, what could we do to help?” She saw an unmet need helping clients in mourning; the more hard-nosed Habstritt identified growth potential. So Vets To Go introduced Paws To Rest, which offers an array of post-euthanasia services, including body removal, cremation, and ashes delivery. Clients immediately appreciated having the option, which sparked a revelation: that Vets To Go could become a go-to source for many things busy pet-owners need. That includes medication: Vets To Go doctors have long taken 20 common pet drugs to all house calls, but not an entire pharmacopoeia, meaning customers had to venture out to fill many prescriptions. “So, we started a pharmacy,” Habstritt says, which delivers prescriptions to clients’ homes within 24 hours. It also includes chow: The company’s food delivery arm specializes in the higher-quality or specialized diets often prescribed by vets. The service is particularly popular with seniors and young parents. Evolving from a pure service business to one that also distributes products required physical space. In 2015, the company opened a purpose-built facility in Calgary that features its pharmacy, an operating theatre for procedures too complicated to be done in-home and offices for a growing support team. The decision increased the company’s overhead and required financing (secured via a term loan with BDC), but Habstritt and McClelland felt it necessary to avoid compromising the quality of service as the business expanded. It appears to have been the right move; the company’s average customer rating on Facebook is 4.9 out of five.